Travis Wilson is pictured with his award for winning the recent T-H Marine Fishing League Worldwide Bass Fishing League Illini Division Tournament at Rend Lake in southern Illinois. 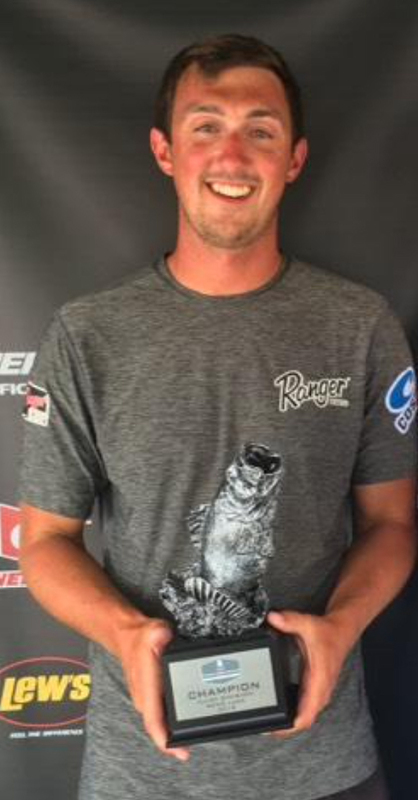 MACOMB, IL – A Western Illinois University alumnus recently captured a T-H Marine Fishing League Worldwide Bass Fishing League Illini Division Tournament at Rend Lake in southern Illinois. Travis Wilson, a 2014 WIU graduate with a degree in construction management, caught five fish weighing 16 pounds and five ounces to win the June 23 competition. For the win, Wilson was awarded just over $5,700. Wilson, of LaHarpe, IL, is a regular competitor on the Fishing League Worldwide schedule. He is also employed full time by John L. Link Construction in LaHarpe. While at WIU, Wilson was a member of the University's Bass Fishing Team and as a junior he was half of the two-man team that won the state bass fishing title. He competed in the tournament with former WIU student Tim Himsl, of Macomb.